North gopura and colonnade of the Vitthala Temple, Vijayanagara. bl.uk > Online Gallery Home	> Online exhibitions	> Asia, Pacific and Africa Collections	> North gopura and colonnade of the Vitthala Temple, Vijayanagara. 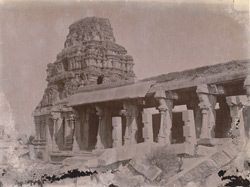 This photograph was taken by Henry Cole in the 1880s for the Archaeological Survey of India. The Vitthala Temple is one of the greatest monuments in existence at Vijayanagara, now known as Hampi, in the modern-day state of Karnataka. It dates to the sixteenth century. The complex consists of an impressive group of structures set inside a rectangular court. The principal feature of the temple is the open mandapa with massive granite piers fashioned in clusters of colonnettes and as rearing animals and riders with composite brackets. The temple is approached through three multi-storey gopuras elaborately carved and lined with colonnades.